From this state of limited consciousness, I appear once again to be a separate form within samsara; but from the state of expanded awareness, all of samsara is a manifestation of myself. I am a single undifferentiated Mind, yet I shine forth, like the radiant beams of the Sun, as a universe of countless living beings, all made of my light. All beings are united in me, for I am their consciousness, their form, their very being. Never are there any separate selves; that is only an illusion produced by the limiting of consciousness. All are but players in the outflowing radiance of one Being. These transient forms live but for one moment, but I, One, live forever. Though I appear as many, I am forever One, forever serene. THUS SPAKE THE BUDDHA as recorded in the Dhammapada, under a peepul tree in Bodh Gaya upon the moment of his enlightenment. After a long and arduous path of striving and effort, the “Blessed One” realized the ineffable truth of all existence, namely that he was, ultimately, beyond the world of name and form, birth and decay, the ocean of maya. In Lumbini, modern-day Nepal, Siddhartha Gautama of the Sakya clan was born to a king, Suddhodana, and his wife, Maya, in around 586 BCE. Unfortunately, his mother died seven days after the delivery and thus her sister, Mahapajapati Gotami, also married to Suddhodana, raised Siddhartha as her own. At the time of Siddhartha’s birth, a holy man predicted the boy would end up ruling the world or renouncing it. And thus to ensure that his son would grow up as a great king, Suddhodana surrounded him with luxury and splendour. At sixteen, Siddhartha married the princess, Yashodara, and together they had a son, Rahula. All went well until he reached the age of twenty-nine. Travelling outside the palace gates, Siddhartha encountered four aspects of human existence he had never seen before—an invalid, an old man, a corpse and a wandering ascetic. Profoundly shocked by the experience, Siddhartha decided right then and there to renounce his family and all his wealth and find the meaning of suffering and liberation from it. 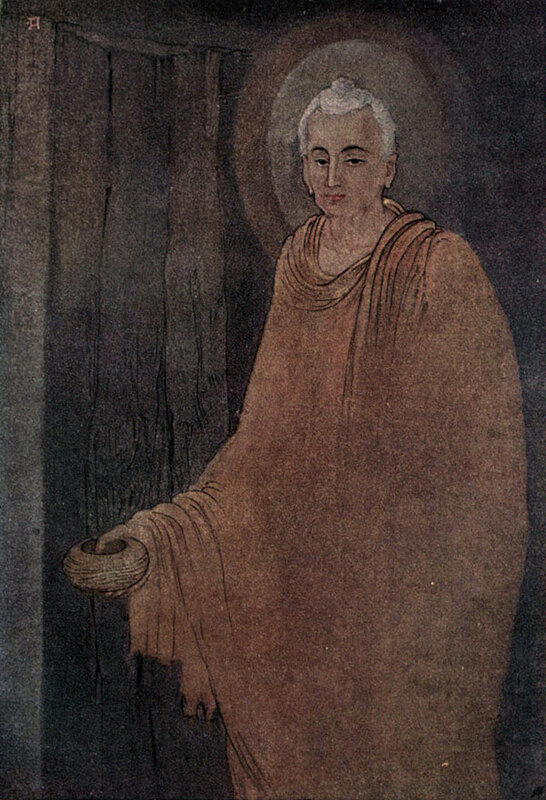 After six years of extreme austerities and intense study, Siddhartha Gautama realized that the secret to peace was in fact the “Middle Way”, a moderate path encompassing meditation and the ability to discriminate between a life bound by samara, the world of illusion and suffering, and nirvana, the underlying, all-pervading consciousness. 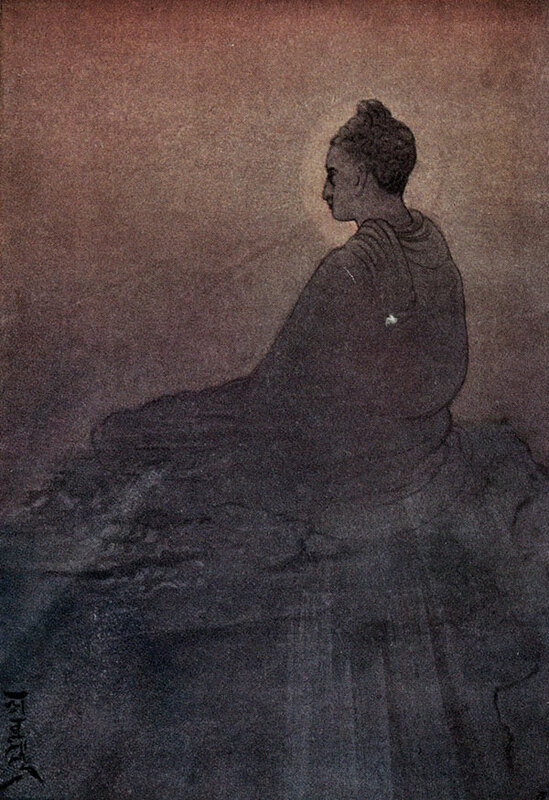 Abanindranath Tagore, Buddha as Mendicant. During the centuries approaching the turn of the then new millennium, the mystical tradition of the Vedas and Upanishads was being subverted by the priestly class into a ritualistic religion steeped in superstition and dogma, supervised by an unenlightened brahmin hierarchy. What the Buddha set out to accomplish was brush away the multifarious descriptions of the one Self, such as Siva, Shakti, Brahman and atman, as well as god and goddess mythology, all of which sought to objectify the formless state. Instead, he put greater emphasis on the actual experience of the Self or no-Self (Anatta or Anatman), a place beyond name and form, and yet knowable by all those who sincerely wanted it. Thus by calling Reality “nirvana”, meaning “extinction” or “nonbeing”, he hoped to put an end to the increasingly diverse interpretations of the One. Indeed, the Buddha would often be asked to comment on all manner of metaphysical arguments about the origin and nature of the universe, upon which he would remain silent. What is the point, he would argue, when knowledge of onself is not even known? Choosing to share this simple and yet profound insight, Siddhartha travelled to Benares to give his now famous sermon on the fundamental precepts of the Buddhist teachings. In his discourse, he expounds the “Four Noble Truths”: that there is suffering; that there is a cause of suffering (owing to the false belief in the illusory ego); that there is a remedy to suffering (enlightenment); and that there is cessation of suffering (through the destruction of ignorance by the practice of the “Noble Eightfold Path”—right understand, right intention, right speech, right action, right livelihood, right effort, right mindfulness, right concentration). The Buddha, also know as the Tathagata, the “attainder of Truth”, subsequently established a sangha or order of monks where the dharma (or dhamma) of the doctrine on the nature of Reality was taught. Regarding the ordination of women into the sangha, however, the Buddha was adamant that they were not allowed in. Believing that the female nature was prone to waywardness and possessed by the power of section, he feared that the monks (bhikkhus) would be adversely affected by their presence. Nevertheless, owing to the fact that many men had either died in battles between warring clans or had decided to become mendicants, many women were left on their own, feeling displaced and lacking moral guidance. Mahapajapati, Siddhartha’s foster mother, thus became a source of strength and support for many women in the district. Moreover, inspired by the transformation in her foster son, she too was overcome by the desire to be initiated into the supreme knowledge. ‘Enough, Gotami. Don’t set your heart on women being allowed to do this.’ [A second and a third time Mahapajapati made the same request in the same words and received the same reply.] And thinking that the Blessed One would not allow women to enter into the homelessness, she bowed to him, and keeping her right side towards him, departed in tears. Then the Blessed One set out for Vesali. 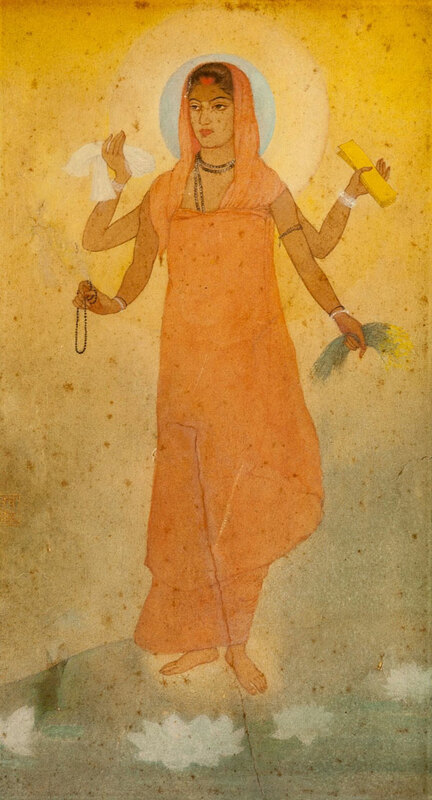 Mahapajapati cut off her hair, put on saffron-coloured robes, and headed for Vesali with a number of Sakyan women. She arrived at Kutagara Hall in the Great Grove with swollen feet and covered in dust. Weeping, she stood there outside the hall. Then Ananda thought: The Blessed One does not give his permission. Let me try asking on other grounds. 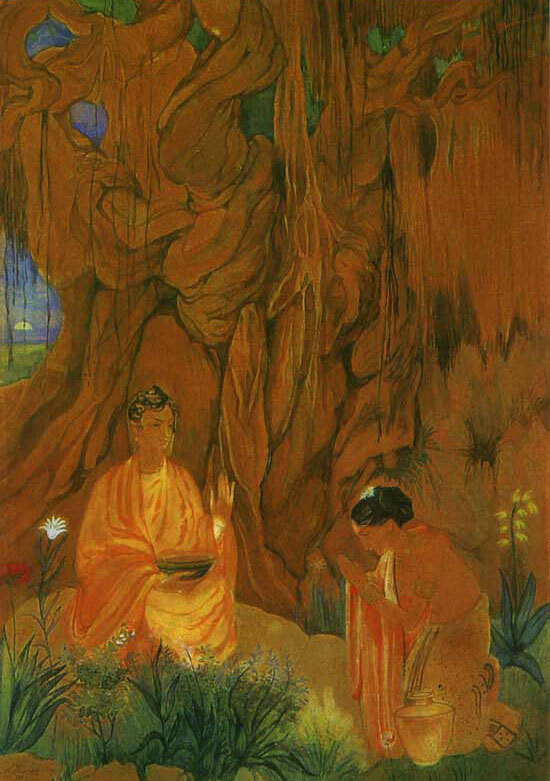 Abanindranath Tagore, The Victory of Buddha. The Buddha had acquiesced but there were conditions. The Eight Special Rules, not to be confused with the Noble Eightfold Path, were additional precepts to be adhered to by nuns only. These included the first rule, which stated that a nun, a bhikkhuni, even of a hundred years’ standing, should bow down before a monk ordained even for just one day; and the final rule, which expressed that admonition of monks by nuns was expressly forbidden, whereas admonition of nuns by monks was not. Mahapajapati and her fellow women reluctantly accepted these stipulations and went on to establish a community of Buddhist sisters of their own. And the Venerable Ananda went to the Blessed One [and repeated her words to him]. It is difficult for us to appreciate the cultural context of the Buddha’s refusal and whether Mahapajapati was successful or not, we do not know. Despite her frustration, however, this did not stop her veneration for the Blessed One for revealing to her the sacred Dharma. 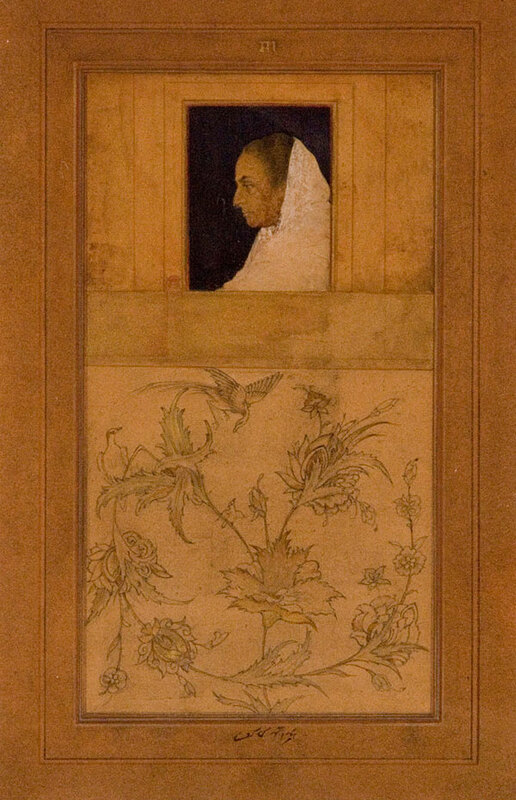 Indeed, such was her gratitude that she and her Buddhist sisters went on to compose poetry and songs in praise of his teaching. Grouped together, their exquisite lyrics are collectively known as the Therigatha—theri means “women elders” or “women who have grown old in knowledge”; gatha means “verse”, “stanza” or “song”. 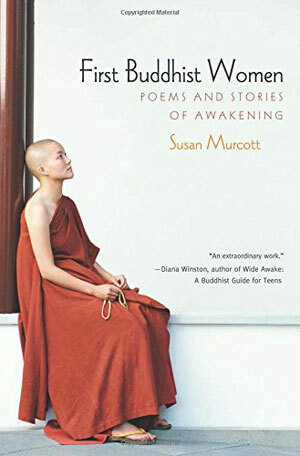 Such creative outpourings of women formerly from all strata of society—widows, wives, single women, prostitutes—thus became a living testament to the fact that enlightenment was exclusively for all, not just men of the upper echelons of the caste system. Initially handed down orally through the generations, the seventy-three poems of the Therigatha were finally recorded in Pali in the first century BCE. I have reached the state where everything stops. of the sick and dying. Mahapajapati lived to be around 120 years old. Having such an eminent position in the sangha, she would have had hundreds of nuns under her care, helping them realize the Truth. Perplexingly, the Buddha continued to have doubts about admitting women into the women’s order right up until his death. Indeed, it is hard to imagine why a wise teacher, advocating a philosophy so free from dogma, retained such a prejudiced position. Interestingly, his prophesy in one sense was to come true—by the fifth century CE, the sangha of Buddhist nuns had, to all intents and purposes, died out and it would take the pioneering work of Ayya Khema (1923–97) to establish Parappuduva Nuns Island, just off the coast of Sri Lanka, and re-establish the rights of women Buddhists. Moreover, as the centuries passed after the Buddha’s death, the pure Buddhist teaching diluted into multifarious interpretations, spiltting into two “vehicles”—the lesser vehicle of Theravada Buddhism in southern India, which believes in a personal and final enlightenment; and the greater vehicle of Mahayana Buddhism, in northern India, which believes that enlightenment should be postponed in order for the individual to reincarnate and help all other sentient beings. Inevitably, a complex Buddhist mythology would also emerge, including the deification of the sacred feminine, in particular the female bodhisattva, Tara. This is precisely not what the Buddha had wanted but perhaps it does serve to neutralize the negative perception of women and reaffirm their equal ability to realize the Truth.